I’m finally taking a few of the images I made during my first visit to Squaw Creek National Wildlife Refuge last autumn and putting them into a blog post. 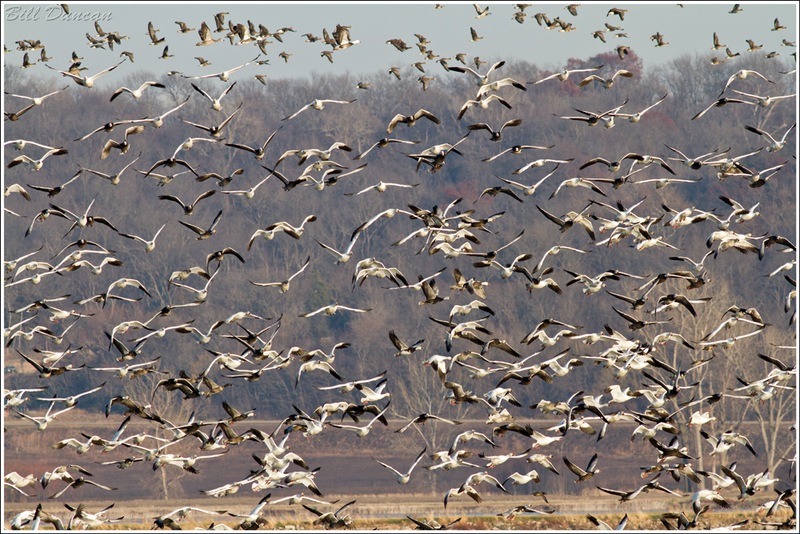 Living within miles of the Mississippi River Flyway – an ancestral route many migratory birds follow in their north-south seasonal movements – I have all sorts of options in visiting well-managed wetland areas to watch and photograph waterfowl. 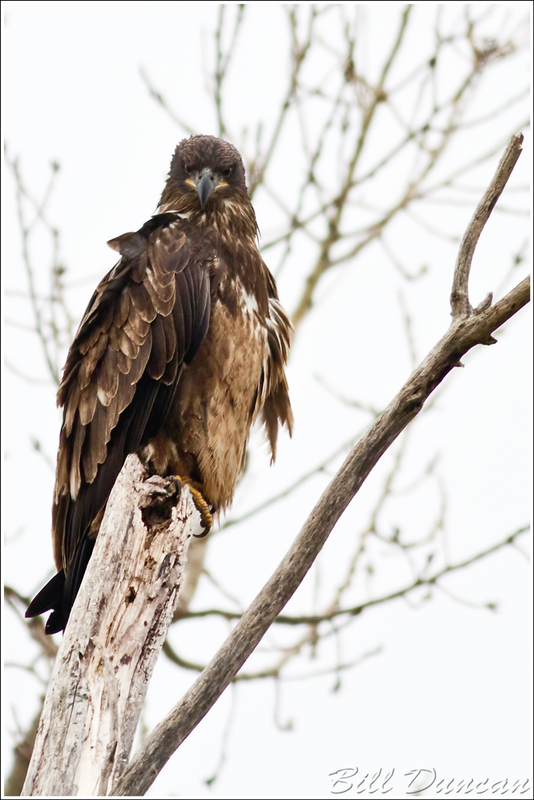 Of all these locations none has the opportunities for getting great looks at numbers and diversity of bird species that can be found at Squaw Creek NWR, located near Mound City in north-western Missouri, not too far from the Nebraska Border. 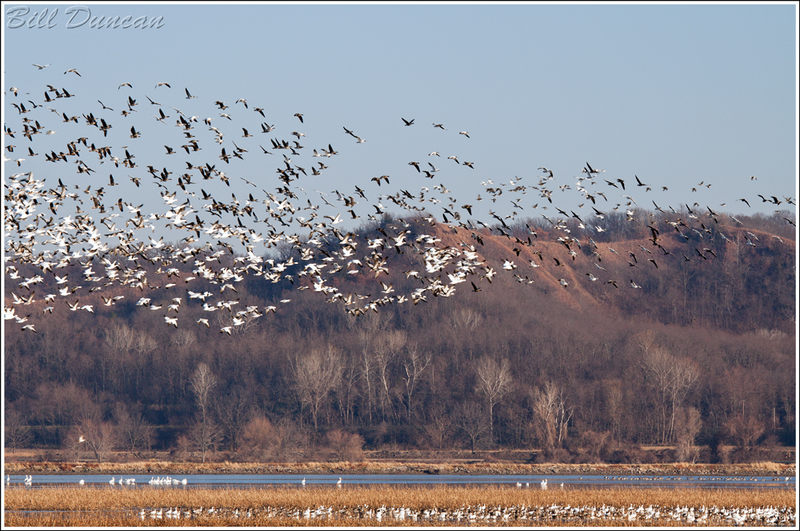 The big stars at Squaw Creek around Thanksgiving and surrounding weeks are the Snow Geese. For years I had read about and seen images of the more than one million birds that pass through this location every fall. 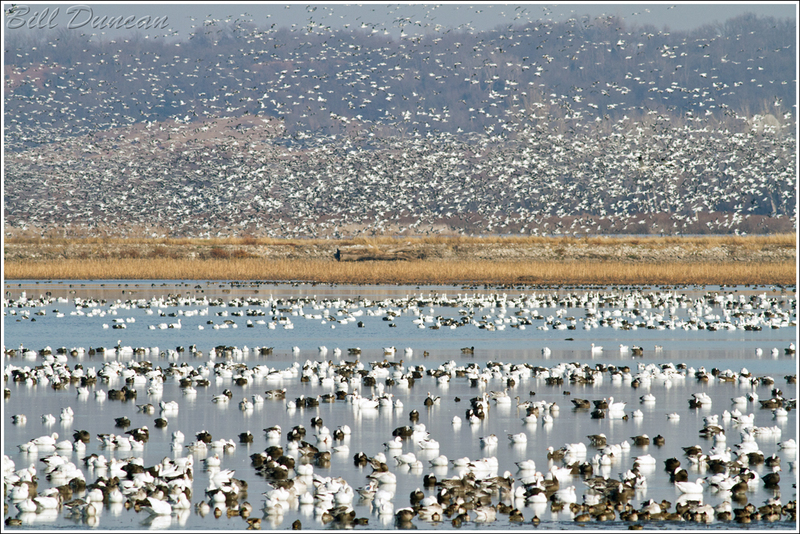 At peak times more than 500,000 birds can be counted on the reserve at one time. I had images in mind that I hoped to make if I could find the birds present in these kinds of numbers. I really had little clue of where and when I needed to be set up and if I had the ammunition (lenses) to make the images I had in mind. I feel the photos I was able to get are of mixed success due to several reasons. I was quite lucky in the numbers of birds that showed up. A week before my visit the counts were only a little more than 10,000. 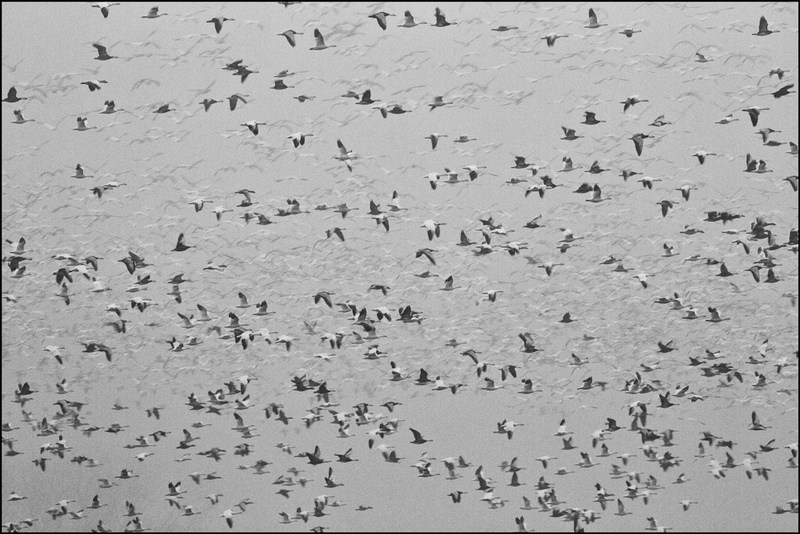 The day I arrived the latest weekly count suggested there were more than 250,000 on the reserve. This is shy of the 500-600K that can be found during peek times, but for my first visit, it was quite a treat! Of the 1.5 days I had to spend here, one full day was very cloudy and dark, making bird photography particularly troublesome. Around noon on my last day the sky cleared and I was able to get some nice light. Hopefully I can spend a few days more during my next visit. Snow Geese are not the only waterfowl that can be found in good numbers here. In almost every one of these types of images Greater White-fronted Geese, Green-winged Teal, Northern Pintail, Mallards and more can be found as well. Squaw Creek NWR and its 7500 acres was established in 1935 just in time. Close to 98% of the original marshes and related wetlands that border the Missouri River in the state of Missouri have been destroyed or permanently altered – mostly for use as farmland. Thankfully sportsmen realized the importance for providing habitat for migrating and over-wintering waterfowl and a series of these man-made marshes were built near Kansas City, Columbia and St. Louis. This image is actually a composite of two separate photographs – the foreground and the background, both taken in extremely cloudy and grey conditions. I was surprised by how well this blending worked and I feel it represents what it was like on this first day, the geese constantly taking off in large groups and others taking their place in the marshes. Waterfowl are not the only birds or wildlife that utilize the reserve. Although you can see more Bald Eagles in spots along the Mississippi River, I have never been able to get as close to these birds perched as I did during this visit. This is true with the wildlife in general. The auto-route roads were set perfectly in the reserve, in my opinion. Getting close enough to the wildlife can be troublesome from the roads at other places I visit, but here the roads are much better situated near the pools and the wildlife never seem to be overly stressed. During the time of my visit with cloudy weather and poor light, I was able to get closer to several duck species than I have ever been able to before. 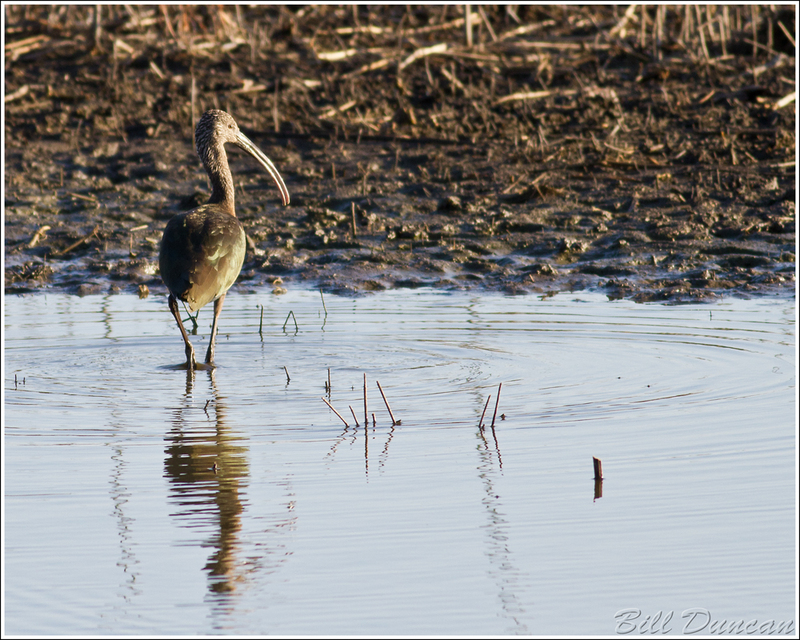 This White Ibis was actually a very late bird for this part of Missouri and it made a bit of noise in the MO birding community. This was also one of my best looks at this species. I had found it the day before and took some rather poor photos. I was happy to see it still in the same pool the next day when light was better. This image is probably my favorite from this trip. To me, it really captures the essence of the place and I believe this is what this area looked like when Lewis and Clark first laid eyes to this part of the country. The bluffs in the background are known as loess hills and are formed by the actions of glaciers. Along with draining the natural wetland habitats along the Big Muddy, European settlers also got busy destroying many of the impressive loess hills, using the fertile soil for numerous development and farming projects. Many of these features are still being harvested and destroyed to this day. There are several more nationally well-known reserves like this throughout the country that scores of photographers, nature lovers, biologists and sportsmen flock to every year. I can’t imagine a spot being more suited for these activities than Squaw Creek NWR. I hope to make an annual pilgrimage to this location on Thanksgiving week. If you make the visit and are looking for a nice place to eat, I highly recommend “Klub”. This is a great place to enjoy a late dinner after spending the day at the reserve, which is only about ten minutes away. They have a great menu using a lot of fresh, local ingredients. I ate here twice during my visit and I was quite surprised to find such a quality establishment in such a little town like Mound City.